Years of mafia-led toxic waste dumping has turned parts of Italy's Campania region into a "Land of Fires". Rossella Muroni, director general of environmental organization Legambiente, tells The Local why it will take more than an army operation to help rebuild locals' lives. In the heartland of the Camorra mafia, Italians are suffering the effects of years of toxic waste dumping at the hands of the criminal underworld. According to the environmental organization Legambiente, ten million tonnes of waste have been illegally dumped or burnt in the Naples and Caserta areas over the past 22 years, prompting the area to be dubbed the “Triangle of Death”. The impact is staggering - cancerous tumours have risen by 47 percent in men and 40 percent in women, data from the Pascale National Tumour Institute shows - while children’s lives are marred by the toxic waste surrounding them. In a bid to crack down on the ecomafia, the Italian Senate on Wednesday approved an emergency law aimed at cleaning up Italy’s “Land of Fires”. The move came just weeks after the government agreed to send the army to Campania, a decision the director general of Legambiente says is both inadequate and alarming. “This is something that worries us a lot...We have already seen army operations in this area, they’re not useful,” Rossella Muroni told The Local. Sending the army in may grab people’s attention and boost the government’s credibility, but Muroni argues it will do little to help people in Campania. “They should reinforce the law enforcement agencies that are already there; the environmental police (Corpo forestale dello Stato) that continues to do excellent work, the financial police (Guardia di Finanza) and the other police forces,” she says. Sending doctors and pediatricians would have a more positive impact than putting army boots on the ground, Muroni adds. While the government’s efforts may be misguided, Prime Minister Enrico Letta is seen by Legambiente to be doing more than other leaders in recent years. “In 20 years nothing changed; the lack of security controls saw the Camorra build its own business...the system was allowed to go corrupt,” Muroni says. The result is a trade in toxic waste that has spread throughout Italy and allegedly across Europe. “If the investigations being carried out by police and magistrates prove that waste being burned in our country is coming from other countries and involving foreign businesses, it becomes an international issue,” says Muroni. In a 2013 report Europol, the EU’s law enforcement agency, described illicit waste trafficking as an “emerging threat” to the EU. “The current economic crisis is driving companies to cut costs associated with the production process and may encourage the use of OCGs [organized crime groups] offering illicit waste trafficking and disposal services,” the report said. 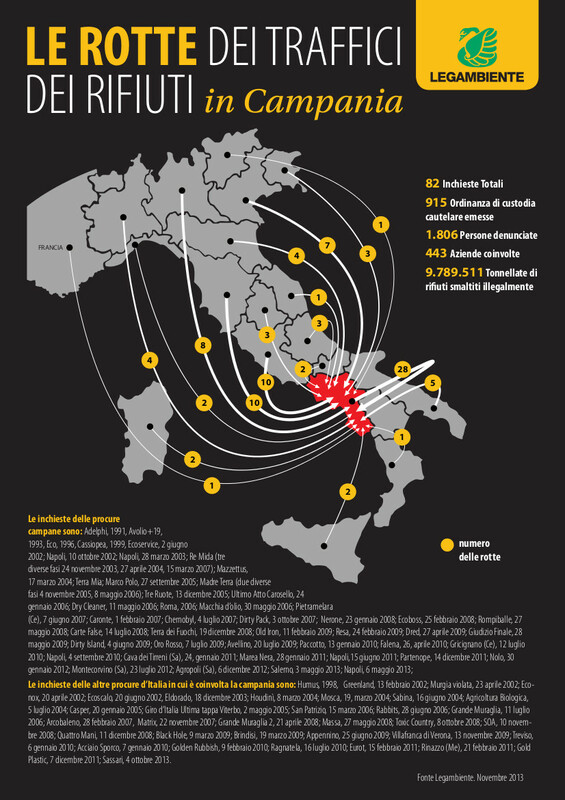 While the Campania region is the worst-affected part of Italy, Muroni says waste dumping is also happening in the Calabria region - the home of the ‘Ndrangheta mafia - and Puglia and Molise in south-east Italy. Despite the mafia’s tight grip on society in southern Italy, Muroni says locals have started to fight back against the waste dumping. “This is a popular movement, with mothers and priests,” she says. “Citizens have understood that while in the past the Camorra has brought benefits to the community, such as creating jobs and funding community projects, they now realise that the mafia has instead robbed them of their children's lives." In November up to 100,000 people took to the streets of Naples, rallying against the Camorra and calling on the government to take action. “The people are now waiting for a response from the state,” says Muroni, beyond what she sees as the inadequate measures taken since the start of the year.